With the falling of the leaves, so to is the mercury, indicating that winter is already on its way. Now is the time to start performing asphalt maintenance to get your paved surfaces ready for the winter onslaught of snow, ice, road salt and frigid temperatures. Winter’s already got enough hazards, you don’t want your parking lot or sidewalks to be another. Their may be no bigger enemy of safe roads and sidewalks than winter weather. It’s not just slips and falls on ice that you need to be worried about, either. 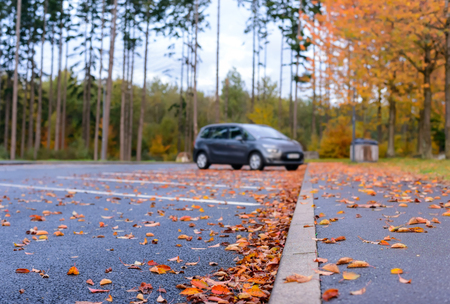 Damage done during the winter can cause pavement to heave and buckle, leaving cracks and bulges that become a tripping hazard. Your first order of business should be cleaning any pavement, either blowing or sweeping up gravel, leaves, dirt and debris from your pavement’s surface. This keeps pavement free of debris which can be ground into its surface, ruining its protective coating. Once water gets in to a crack in the pavement, no matter how small, it will freeze and weaken the surface. That makes it more susceptible to cracking later. Spending some time sweeping your paved areas also allows you to get up close and personal with it, spotting small cracks that could become bigger problems. Once you’ve given your pavement the once-over, have problem areas addressed. It’s too easy for ice and snow to exacerbate any pavement issues. Small cracks may be much larger after just one winter. Even if it means performing just a temporary patch until spring, its better than rolling the dice on winter. You should also have any paved surfaces sealcoated every one to three years to keep it in the best shape possible. Assess your pavement for any areas where water is pooling or not draining correctly. If water can’t drain off paved areas correctly, it will gather and create big problems. The constant freezing and thawing in one spot can crack and heave an area rather quickly. Make sure drainage is free and clear to do its job, have drains cleaned if they aren’t.